Oudh (or Aoud, or Oud or however it's spelled) is a note that I have learned to really love. Through Kelley I've discovered Montale and through Marina I've discovered the wildly priced Arabian Oud line. This year seems to be the Year of Oud in niche: everyone from Tom Ford to Le Labo has one. Created by Berntrand Duchaufour, Al Oudh could almost be accused of false advertising. Patty at Perfume Posse described it as "sweaty armpit" while Robin at NST calls it a "bold, very enjoyable outing". I get a boatload of cumin. Cumin, cumin and citrus opening, cumin, cumin, cumin and oud with roses middle and cumin, cumin, cumin, cumin, vanilla, civet and cumin drydown. (spam, spam, spam, lov-e-ly spam...) I happen to like cumin in scents, even unto Eau d'Hermes and I do like this one. A lot. Despite the cumin-heavy mix it's only really overwhelming in the first half hour: after that it's silky smooth. Unless of course, you don't like cumin. If you dislike that note then I suggest staying well clear: unlike a some L'Artisan scents, this is quite tenacious. Al Oudh is $155 for 100ML available at the usual suspects. I spritzed at Barneys and asked for and received a sample at ScentBar. Hm, I'm an oud-fan, and I do like the "horse sweat"-y oud of LeLabo - but am I brave enough for that much cumin ? Marina -- thanks for this post; intriguing, especially as Duchaufour is behind it. Oud scents are always of interest to me and on my blog I recently reviewed "Duro", which is for me like M7 without the sweet bit. The Pierre Mondale ouds are also good -- thought I can never keep them all apart; a few too many in that range. You are absolutely right, this scent is all about cumin, not oudh. I was very disappointed with this when I tried it. Not that its bad, its just too tame for its own good and on me not tenacious in the least. I love me some oudh, but I need to look elsewhere for my fix. Hmm - is it anything like Timbuktu? I do like cumin, but it can be hard to wear around other people. I'll have to read that review! I thought it was kindsa clever.. It's not very Oudh-y at all. But I do like what's there. On me it was very tenacious (for L'Artisan), but it luckily didn't project a lot. I agree.... " boatload of cumin. Cumin, cumin and citrus opening, cumin, cumin, cumin and oud with roses middle and cumin, cumin, cumin, cumin, vanilla, civet and cumin drydown. (spam, spam, spam, lov-e-ly spam...) "
p.s. did you try Havana Vanille while at LuckyScent? If so, yay or nay on this one? I like Havana Vanille, but I have enough Vanille in my life at the moment. Also, Al Oudh pretty much made Havana Vanille run home to it's mommy. If you don't like cumin then you will loathe and despise this. 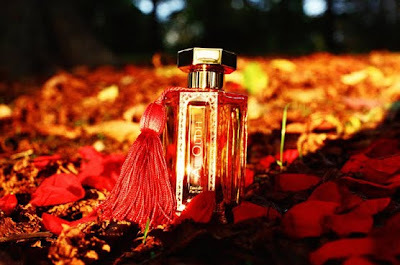 hello, I'm back to this wonderful blog after months of treatments (cancer), writing, breaking up with my man and coming back to him...in between I discovered Al Oudh, and, perhaps because of the tectonic changes i felt something good and daring about it. In my youth i committed fragrance suicide by spraying L'Autre de Dyptyque, and felt like a shish-kebab for a whole day. That was cumin...and Al Oudh is cumin too, but so intertwined with other naughty and lovelier things - that civet, the rose - that, well, to the amazement of the sales person I bought a whole bottle. I was very disappointed with this when I tried it. Not that its bad, its just too tame for its own good and on me not tenacious in the least.